Boy Child thinks that Daisy should have a Twitter account. I have a Twitter account, but I don’t really know what to do with it. The character limit ticks me off. Baby Boomer that I am, I ain’t gonna let The Man tell me how much I can say. So, there sits my Twitter account, with only occasional tweets, like the gasping chirps of a smoke detector with a dying battery. I have asked for help with my Twitter account from Girl Child, the Queen of All Things Social Media. She sighs, rolls her eyes and stomps upstairs to her room. I agree. Mom having Twitter with the possibility of following her friends WOULD be mortifying. “She got The Religion right before she went to Florida and married that man.” Obviously religion isn’t a bad thing, but if it preceded a sudden change of location or marital status, then it certainly was suspect. As is Twitter. Although I refrain from calling it The Twitter, I still suspect the idea of Daisy having a Twitter account. I have been raising youth in the age of cyberbullying and cyberstalking. I know the dangers. What if Daisy gets unwanted attention from a catphisher? Or worse, is bullied? I didn’t realize Daisy’s frustration levels were that high. I thought she was just chillin’ until the weather straightened up and we could get back to work on her. Perhaps we should work on her anger management instead of her Twitter? I suppose we could also get her a Vine account as well as Instagram. We could shoot photos of her pouring champagne into her big old booty and break the Internet. With the rot she has under her nifty fifties flooring, that champagne would go right through her like last night’s bad Mexican. More importantly, Daisy’s influence would change the Twitter icon from an obnoxiously boring blue bird to that of a pink flamingo. That would end mean and ugly tweets for all time. 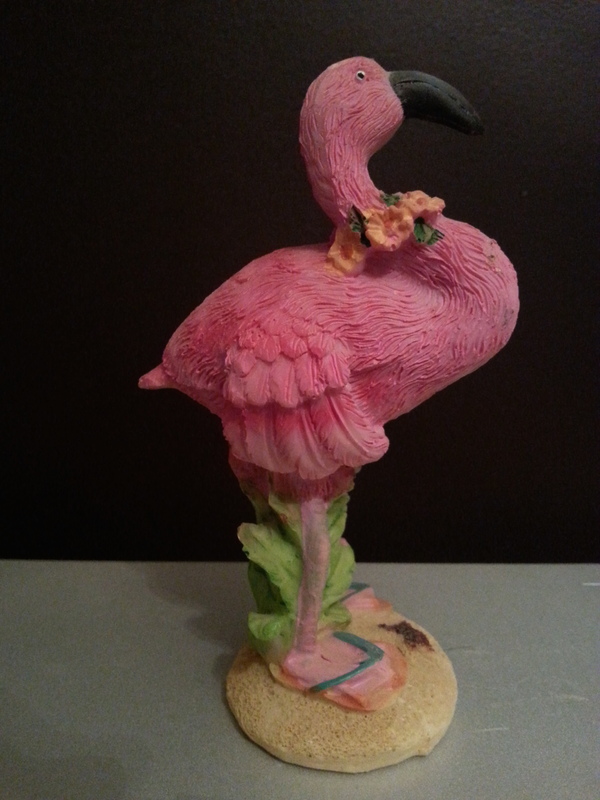 Who doesn’t grin and think happy thoughts when they see a pink flamingo? Okay Boy Child, let’s get Daisy an account on The Twitter. But before she tweets anything, she needs to chill the (expletive) out. < Previous It’s Alive! It’s Alive! Along with the demarcation of “the”; let’s not forget “that”: When discussing anything with “that” it is an automatic negative. Examples: 1) She went to Florida and married that man: read: he wasn’t her mamma’s first choice of spouses. 2) Are you really wearing that? : read: you should be wearing the next size up or you look like you just went dumpster diving. 3) Why would you say that? (usually spoken with BOTH hands on hips): read: I’m about to throw down. I wonder what Daisy will tweet about that family who let her get The Rot. OMG. Carolyn! THAT is hilarious. Told ya you should write!